Awesome is a free one page responsive HTML5 template. Beautifully crafted with HTML5 & CSS3. Download this free one page business website html5 template. 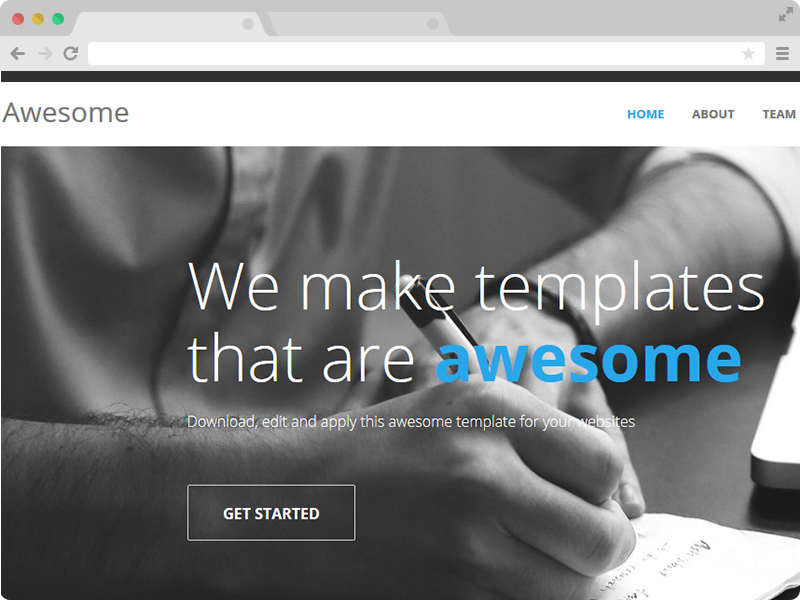 Awesome is a free one page responsive html5 template. It is beautifully crafted with HTML5, CSS3, Bootstrap3 and jQuery. You can use it as free one page responsive business website template for your next business website. It has a eye catchy design and usable user experience. It is a free website html5 template. Blue and darkgray colors are used in this free one page responsive html5 template. This template is free for personal and commercial use. Please don’t remove Themewagon credit link until you donate. Many people can use this free one page responsive html5 template. Awesome is designed in such a that you can actually use it as Business Website Template, small agency website template, startup website template, personal website template and many more. Awesome is a free but entirely responsive HTML5 template perfectly suitable for any kind of business like website template. It is a one page template that is supported on any kind of device. It works perfectly on desktop, laptops as well as mobiles and tabs. This awesome responsive tmeplate was cooked nicely with mobile first design concept. It was first designed and developed for mobile devices and then rescaled to larger devices. It is also a mobile friendly website with cross browser compatibility. It means it supports all major browsers we use. You can check the responsiveness of this free awesome business html5 template on your devices or on Am I Responsive and the mobile friendly feature on Google Mobile-Friendly Test. Awesome is a free responsive SEO friendly website. It was designed using Google SEO Friendly Guide as an SEO friendly site is a must nowadays. It i sdesigne such a way that Google will rankl your site higher if you use this template to design your site. This template is created by TemplateMo. This is a free one page responsive html5 template by TemplateMO. Great template but I can't work out how to get the contact form working. I've linked it to a PHP script. Why is a “FREE” download contingent on having to have a Twitter Account? Surely if you want people to have a “FREE” product, the goal is to make it as easy for them to get it as you can. Hey Conway, thanks for your insight. The things work fine when both sides act evenly and amicably. We’re giving you free products and you’re giving us your email so that we can get connected. Besides, when you tweet it means you care about us. Btw, we have a great option for non-Twitter users. Would you care to know?